NASA’s Solar Probe Plus mission - which will fly closer to the Sun than any spacecraft has before- reached a major milestone last month when it successfully completed its Critical Design Review (CDR). An independent NASA review board met at the Johns Hopkins University Applied Physics Laboratory (APL) in Laurel, Maryland, from March 16 to 20 to review all aspects of the mission plan; APL has designed and will build and operate the spacecraft for NASA. The CDR certifies that the Solar Probe Plus mission design is at an advanced stage and that fabrication, assembly, integration and testing of the many elements of the mission may proceed. APL, NASA and industry team members presented information on construction and testing of the spacecraft and its systems, instruments, science objectives, integration and testing, and mission operations. Solar Probe Plus is scheduled to launch aboard a United Launch Alliance Delta 4-Heavy rocket with an upper stage from Cape Canaveral Air Force Station, Florida. The launch window opens for 20 days starting on July 31, 2018. Over 24 orbits, the mission will use seven flybys of Venus to reduce its distance from the Sun. The closest three will be just 3.8 million miles from the surface of the star. Scientists have long wanted to send a probe through the Sun’s outer atmosphere, or corona, to better understand the solar wind and the material it carries into our solar system. The primary science goals for the Solar Probe Plus mission are to trace the flow of energy and understand the heating of the solar corona and to explore the physical mechanisms that accelerate the solar wind and energetic particles. To meet those objectives, Solar Probe Plus will carry four instrument suites into the Sun’s corona and study the solar wind and energetic particles as they blast off the surface of the star. These instruments will study magnetic fields, plasma, and energetic particles, and will image the solar wind. The instruments are: the Fields Experiment from the University of California Space Sciences Laboratory, Berkeley, California; the Integrated Science Investigation of the Sun (ISIS) from the Southwest Research Institute, San Antonio; the Solar Wind Electrons Alphas and Protons Investigation (SWEAP) from the Smithsonian Astrophysical Observatory, Cambridge, Massachusetts; and the Wide Field Imager for Solar Probe Plus (WISPR) from the Naval Research Laboratory, Washington, D.C. The spacecraft and instruments will be protected from the Sun’s heat by a 4.5-inch-thick carbon-composite shield. During the closest passes around the Sun, temperatures outside the spacecraft will reach nearly 2,500 degrees Fahrenheit. 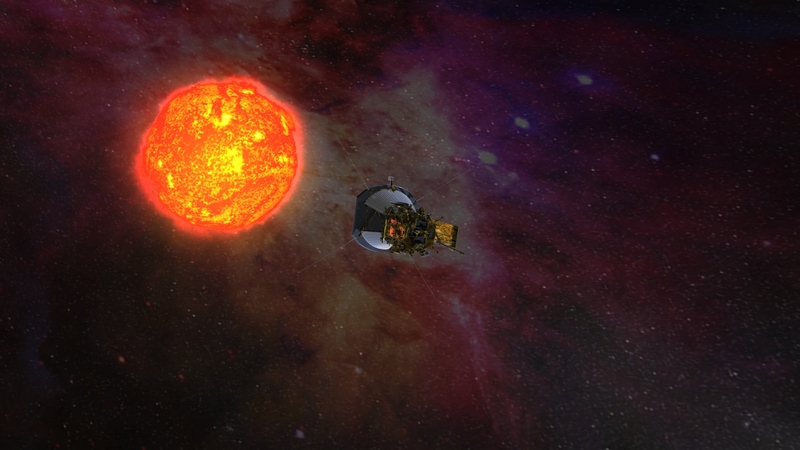 Solar Probe Plus is part of NASA’s Living With a Star Program to explore aspects of the connected Sun-Earth system that directly affect life and society. LWS is managed by the agency’s Goddard Space Flight Center in Greenbelt, Maryland, for NASA’s Science Mission Directorate in Washington. For more information, visit http://solarprobe.jhuapl.edu/. Artist rendering of Solar Probe Plus, solar panels folded into the shadows of its protective shield, as it gathers data on its approach to the Sun.